This week, I'm so happy to be sharing with you the work of one of my favourite stampers, Jaimie MacGibbon ! (The fact that she is my daughter has nothing to do with my estimation of her work! Make sure you leave a comment to let her know how awesome she is!) She is a hobbyist on a limited budget, but you would never know it by the quality of her cards. She is very resourceful, both as a stamper and a decorator. In fact, you should check out her blog, At Home, if you like creating beautiful spaces with a tiny cash outlay. I love Jaimie's choice of paper here. The Tea for Two Designer Series paper deserves star billing on this card, and Jaimie has paired it up just right with Pool Party and Sahara Sand card stock. 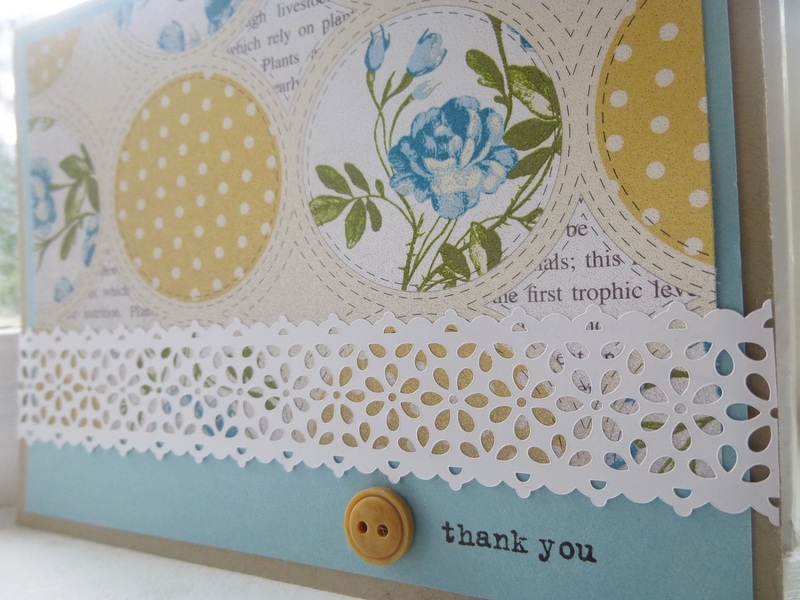 She loves using the Delicate Details Lace tape, and it is the perfect touch on this whimsical Designer Paper. The Naturals Designer Button balances the Teeny Tiny Wishes sentiment perfectly. For some reason, it makes me think of the late Victorian era, in the late 1800's. You don't need to have a lot of tools and equipment to make this card. You can achieve very pleasing designs with very little in the way of supplies. Won't you leave a comment, so she knows it's not just her mother who enjoys her work? She thinks I'm biased for some reason! 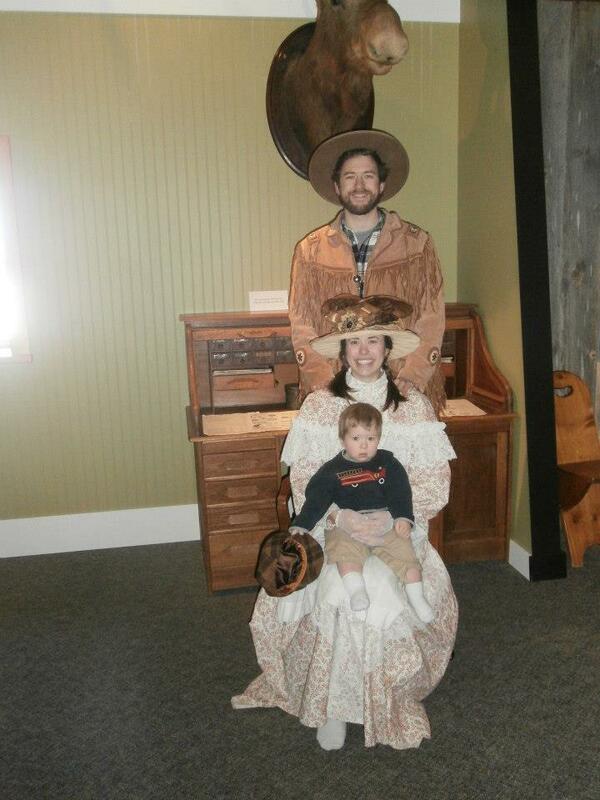 -dressed for the part of a frontier Victorian family! That's my oldest grandson, Parker, sitting on her lap, and my son-in-law, Pat behind her! 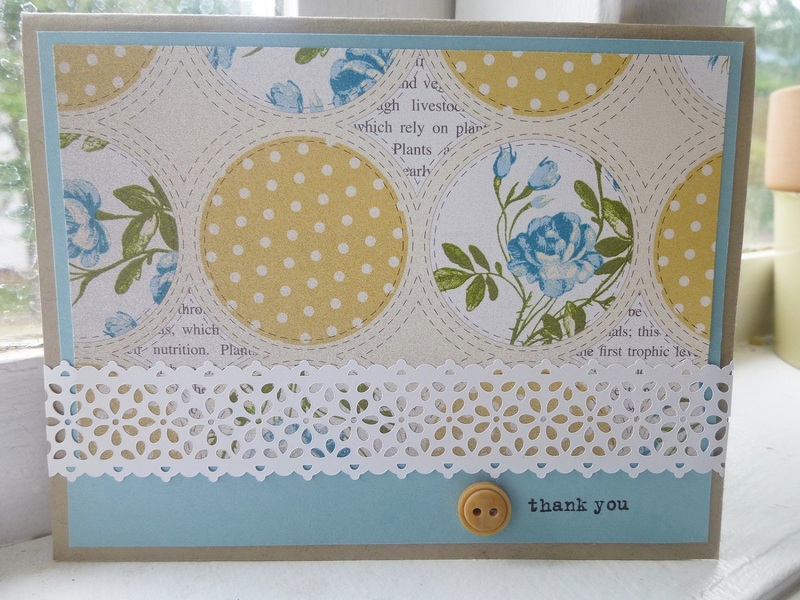 What a pretty card, Jaimie. I love the color choices you made. Delicate and sweet.